Mortimer Zuckerman, the chairman and editor in chief of U.S. News & World Report, announced on November 25, 2011 that America's energy problems are over thanks to the shale gas revolution. He delivered the good news in an op-ed in The Wall Street Journal called "How American Can Escape the Energy Trap". "Soaring natural gas production has already cut the share of oil consumption met by imports to 47% last year from 60% in 2005." Unfortunately, this is not really true. Exhibit 1 shows the data behind oil and petroleum product imports, and it appears that he has done a bit of mixing-and-matching to arrive at the percentages that he cites. It is true that crude oil & petroleum products represented 60% of 2005 U.S. imports compared to consumption. The reduction in imports to 47% in 2010, however, is the percentage of crude oil alone compared to consumption for that year. When we examine comparable categories, it is clear that crude oil imports - relative to total consumption of crude oil and products - were only 2% lower in 2010 than in 2005, and that the big change that he alludes to was mostly in petroleum product imports. Petroleum products are what refineries create from crude oil, and include gasoline, kerosene-type jet fuel, distillate fuel oil, residual fuel oil, and propane and propylene. 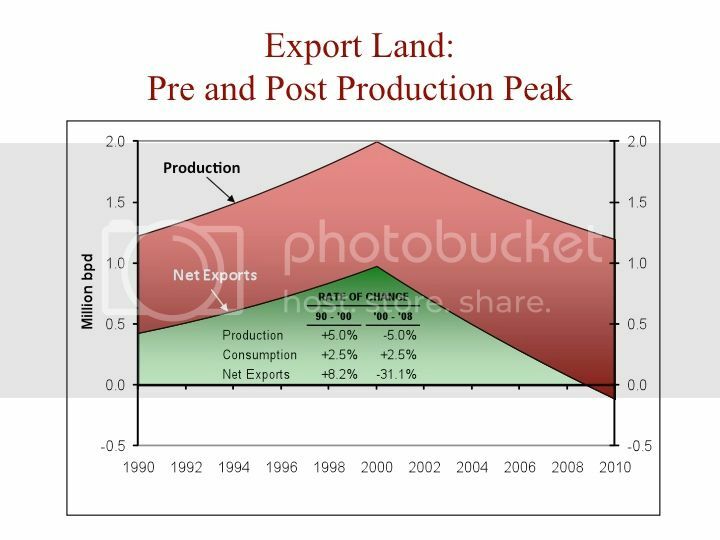 Exhibit 2 explains the drop in imports that Mr. Zuckerman describes: the U.S. has been progressively increasing exports of petroleum products at the expense of imports over the period that Zuckerman compares. We are importing only a slightly smaller percentage of crude oil relative to total consumption of crude oil and products as we did in 2005, but we are selling more of the refined products to the developing world. As the U.S. economy matures and the recession takes its toll on discretionary transport, we are poised to become a net exporter of petroleum products (The Wall Street Journal, November 30, 2011: "U.S. Nears Milestone: Net Fuel Exporter" ). 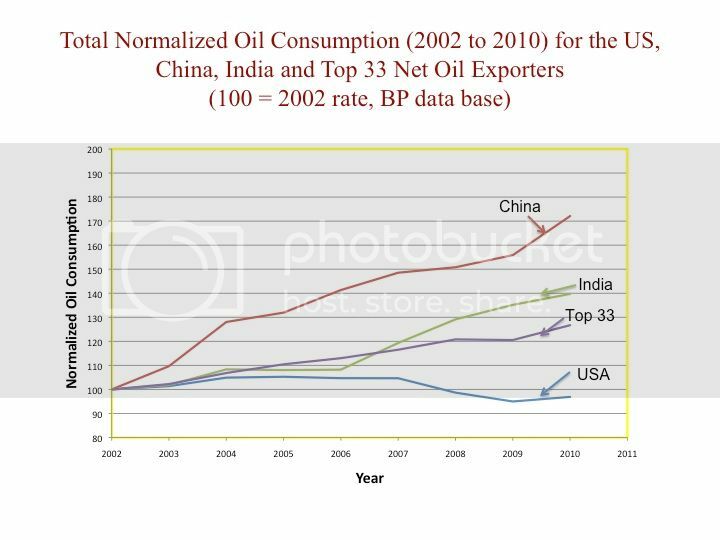 Exhibits 1 and 2 show that the decrease in net petroleum product imports between 2005 and 2010 are best explained outside of the context of shale gas production in the United States. 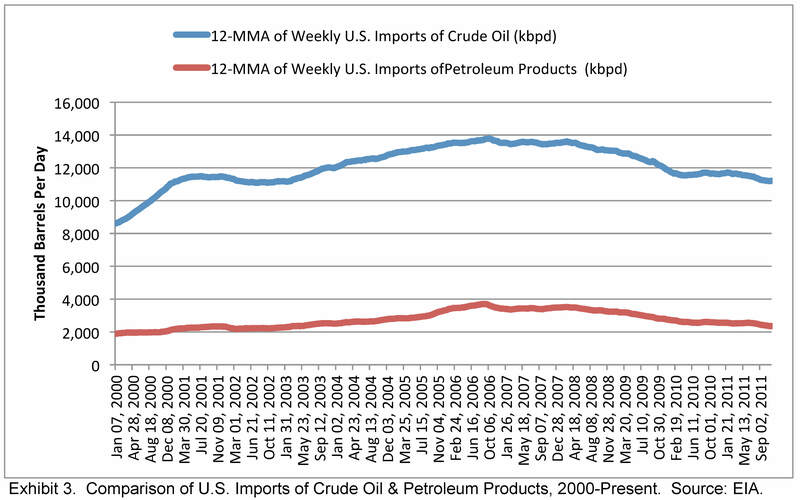 Exhibit 3 shows the longer term trends of both crude oil and petroleum product imports. It indicates that imports of both items peaked in about mid-2006 and have been decreasing since. "...natural gas is already putting downward pressure on oil prices." 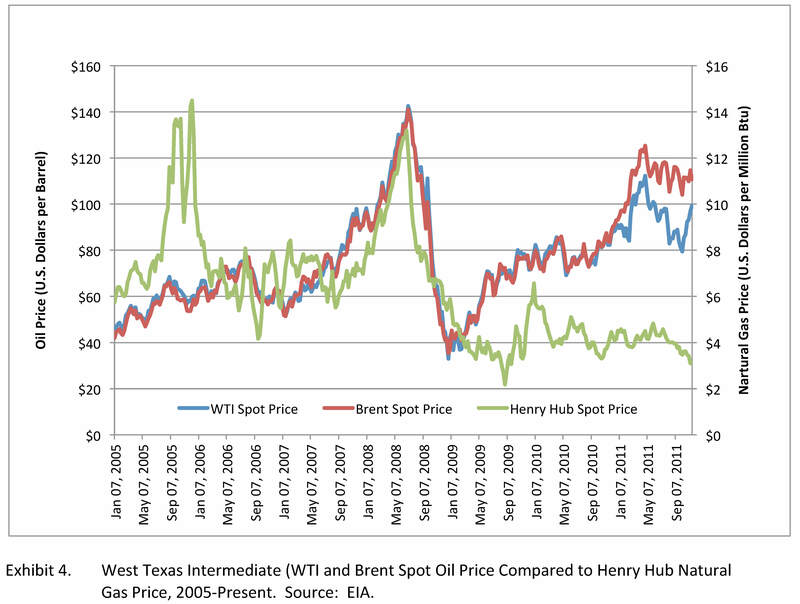 Exhibit 4 shows spot price trends for West Texas Intermediate (WTI) and Brent crude oil in comparison to Henry Hub natural gas price from 2005 to the present. It shows that since early 2009, there has been no relationship whatsoever between natural gas and crude oil price (the natural gas price anomaly in late 2005 was because Hurricane Katrina shut down most Gulf Coast natural gas production). This second fundamental part of his argument, therefore, is untrue. In fact, most shale-gas producers have been shifting their drilling to more oil-prone prospects because of the rising price of oil and the falling price and economics of gas. The shale gas revolution is responsible for many positive outcomes in North America including the creation of jobs, cheaper electricity and lower heating bills for many. It holds some promise for reducing long-term dependence on foreign oil by replacing liquid fuel-powered transport with compressed natural gas or electricity from natural gas. This, however, will take decades and great cost to accomplish. One might ask what motivates someone like Mr. Zuckerman, whose background is in publishing, business and law, to weigh in on a complex subject like changing patterns of energy usage in the United States? He has attempted to make a case that natural gas is somehow reducing our dependence on foreign oil today and is causing the price of oil to fall. While I am as hopeful as he is that these may become long-term outcomes, his position does not stand up to basic fact-checking. To add a few words, This excellent, well documented refutation of Zuckerman's 'statistics' is preaching to the converted. Very few, if any of the the people who see Zuckerman's piece will read , let alone understand this post and have their eyes opened to the truth. First of all , no amount of cross posting references to this site will generate the web traffic Zuckman's post will get. Secondly, very few of the people who read his post will have the statistics training to understand this post, Thirdly and most importantly, Zuckman's post will almost entirely be read by people who want to believe what he is writing. Denial is a river in Egypt (and that is becoming an increasingly poignant cliché given the current state of Egypt). Thanks for fisking this one. 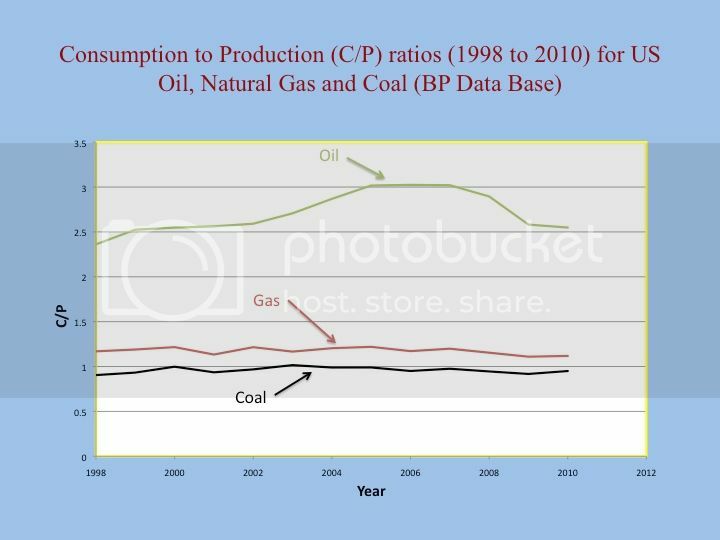 I was astounded when I first read it and wondered how an editor could possibly allow his assertion that shale gas had dramatically reduced oil consumption. How? That article was beyond ignorant. I used to consider the WSJ a fairly reliable source of information but this clearly shows they are clueless. Are you going to comment on his assertion that the costs of shale gas are lower than conventional natural gas? T-E: I'll toss in my standard comment. Forget about conventional NG economics vs. shale NG economics. We drill only conventional NG plays and those economics are better than the oil-rich unconventional plays. And that's obviously with the lower NG prices. If we were a public company we would be hip deep in the shale plays running our stock price up as fast as possible and then cashing out before folks catch on. I've worked both biz plans. Much prefer my current one...very simple: drill wells and sell production at a nice profit. So what'll you do when you run out of conventional plays to drill? Will you retire or consider relocating back to the game fishing* oil industry or alternatively would you be moving yourself to where the deposits are? *Game fishing meaning gaming the stock markets. S - All ready in the process of running out of conventional prospects. As said in an earlier post I'm turning back $40 million in unspent budget. Hopefully this is my last rodeo and will go out on a high. If we do our jobs right me and my cohorts end up with a nice chunk of the equity when we sell the company in a few years. If not then I'll be handling operations for someone. Might be a conventional player or one of the shale players. Doesn't make a big difference on the operations side but my background is well suited for the shale plays. I'm 60 yo and so far my MS has shown no progression. And if I get my broken knee fixed I should be good for a few more years. But after 36 years of being a ground pounder I'm ready to head to the house permanently when the opportunity affords. Hey Rock, what do you think happens to publicly traded energy companies when they are done buying new leases in the unconventional plays? If you know when the public companies have hit peak new leases, does that mean peak proven reserves? Mark - When they hit a peak I think it will be a result of peak drilling equipment. There are many times more undrilled locations under lease today than wells that have already been drilled. Drilling rigs have been added but not nearly as fast as drill sites. The problem operators face in most of the trends (except perhaps for the Bakken to a degree) is that they will have difficulty offsetting rapid depletion with new wells. It's a somewhat self-defeating effort: the more wells drilled to replace depletion and add new reserve base requires more even more wells to be drilled in the near future. Thanks Rock, that’s very interesting. It’s quite hard to get a good understanding of where the public companies stand. I have a theory that since unconventional plays are not profitable, then when public companies can no longer add proven reserves for the Wall Street crowd things may unwind like the .com bubble. Thanks again Rock and thanks for the insightful article Art. Mark - Always a tough call when you're dealing with market timing regardless of the type of commerce. Petrohawk made a tremendous profit due to the shale plays. Not from the production but by selling the company for $12 billion...a great deal more than their cash flow was worth. But another company needed their undeveloped acreage to keep their hype going. And Wall Street will do everything it can to keep the hype alive. They did a great job of doing that with the shale gas players in E Texas right up to the NG price collapse in '08. And then we saw equity losses on the order of 70%+. As always: timing is everything. Sell your Devon stock you bought at $65 for $124 and you did great. Wait a tad too long and you sell it for $38...not so great. Of course, what makes the current game difficult is predicting such a collapse in oil prices. As long as oil prices stay high enough to keep drilling (even if only marginally profitable) the hype will be self-perpetuating. Engineer, I believe the article better illustrates the fact that whoever owns the WSJ has a strong interest in promoting bau than the incompetence of the editors. It does of course amply prove that the editors are EITHER incompetent OR professionally and ethically compromised.Considering that the individuals involved have by hook or crook and maybe marrying the owner's fat ugly daughter managed to claw their way to the top of their field,I believe it is safe to rule out stupidity. We have debated the freedom, or lack thereof, of the press many times here. IMO the press is roughly about as free as the owners and advertisers want it to be. I read the WSJ occasionally at the local college library, and while most of the stuff in it is obviously vetted to make sure it does not unduly upset Wall Street or anybody who lives on Country Club Lane,is is otherwise generally a very well written paper..
Fortunately for us peons the rich and powerful are faction ridden, and this fortunate circumstance ensures that at a great deal of important news sees the light of day, as no one faction controls all the primary media. Unfortunately, there is a convergence of interests among all the truly powerful factions.It is not in any of their interests as INDIVIDUAL factions to challenge the Hegemony of the Church of Perpetual Progress and Eternal Growth.Quite the contrary situation holds true-virtually everybody in a position of power and influence understands that the only real assurance of their continued hold on their spot at or near the top of the pyramid depends on the continuation of bau. Eventually, the truth in respect to our overshoot predicament will become so embarrassingly obvious that some major media organization or another will turn traitor, seeing this strategy as being an irresistible opportunity to vault to the top of the heap. This bombshell event will be an ironclad indication that the crash is very near-or to put things a bit more bluntly- the precipitating event that goes down in history as the trigger that marking the beginning of the end of the Fossil Fuel Era. This convergence of interests brings about a situation that reminds me of the very real concept of "honor among thieves".They- either the thieves or the media factions- are usually at each others throats as a matter of course in some respects, but in neither case can any party ordinarily risk turning traitor to the greater cause of the survival of the class. The one and only thing a member of the criminal class can do which utterly and totally strips him of honor and status among his own kind is to turn snitch;the sanctions against such behavior run from a severe beating among amateurs to murder among the pros. Any writer or editor who dares challenge the orthodoxy of the Church of Perpetual Progress and Eternal Growth is of course immediately excommunicated and permanently blackballed. Of course a few such heretics manage to survive professionally by writing books,, giving presentations, and running websites, thus eventually gaining a small following of their own.But even then, nearly all their converts are still locked into the old religion by virtue of the fact that their own individual social and economic survival depends on their continued good standing in the COPPEG. The this convergence of interests among various media factions results in some interesting results when strange bedfellows share the bed of common interests. The NYT and NPR are two of my favorites, but I never cease to get a horse laugh out of their efforts to promote a mating of environmentalism and bau in the same breath..
Fox News and Rush Limbaugh etal are equally determined to ensure the continuation and health of bau by drowning the competing paradigm of environmentalism like a kitten in a sack, failing to realize that the ONLY HOPE of bau having grandchildren consists of that same mating producing viable offspring. Any old farmer could tell them all, if they would listen, that first, even the most virile bull simply isn't interested in even the prettiest filly, and second, that even when the two prospective parents can be enticed into violating their normal sexual taboos, the off spring, if any, are usually sterile. Articles like this are the reason people are so confused about our energy situation. When people hear the term petroleum exports they automatically think that the US is capable of exporting crude oil which is a joke! These politicians and journalist that don't know anything about the petroleum industry need to stop talking about the petroleum industry. The primary contributor to the US becoming a net exporter of refined products and the primary contributor to the decline in US net oil imports is declining consumption in the US, as the US and many other developed countries have been forced, post-2005, to take a declining share of a falling volume of Global Net Exports (GNE), which are calculated in terms of Total Petroleum Liquids. The WSJ reporters are taking a symptom of Peak Exports, i.e., declining US oil consumption, and presenting it as a positive story. Declining oil consumption is is a positive story. We don't need oil, and the sooner we kick the addiction the better. Absolutely right. I will advance the concept. Oil is obsolete. It just doesn't know it yet. And yet...I think it senses it. The average person working in the industry doesn't realize it. Many people on TOD, like Jeffrey and Gail, don't see it yet. But, people at the top, like the Koch brothers, recognize a threat when they see it, and that's why they and their allies fight so hard against EVs and renewables. Have you seen the recent campaign against the Chevy Volt by Fox news? But the Koch brothers don't control all the oil industry. All they need for their part to be profitable is high oil prices - which they have. EV's and renewables will displace imports - most all of which (except from Canada) come from NOC's where the Koch brothers, and Exxon etc don;t get anything out of it. I would think that oil consumption would have to halve before the oil volumes of Koch, Exxon etc are threatened. And even then, oil is far from obsolete, it is still needed for planes, ships, plastics etc. It will still be the fuel of choice - if price is no object. 1-Why do successful people continue to work hard, even obsessively? 2-What effect does a reduction in consumption have on prices? 3-How long will oil be the input of choice for major industries? Regarding question 1: I think the answer is that successful entrepreneurs are selected from a large pool by almost obsessive work habits (and, of course, some luck). That's what made them successful, and there's not much to change that once they are successful. In the case of the Koch brothers - they were born with a lot of money. They could have stopped right there. If they didn't then, what's different when they have 50x as much money? Regarding question 2: elasticity of supply is pretty small, and elasticity of demand isn't all that great either, at least in the short and medium term. That means that small changes in supply and demand have a large impact. People like the Kochs know this. On the other hand, the elasticity of demand is very large in the long-run: there are perfectly viable substitutes for oil. People like the Kochs sense this as well, and are determined to kill them off before they gain traction. Regarding question 3: substitutes for oil depend on overcoming large barriers to entry, and gaining economies of scale. Once they pass those barriers and attain economies of scale their costs decline. At the same time FF costs are rising. Once the costs of new forms of energy are convincingly lower than FF, FF will decline pretty rapidly. Aerodynamic efficiency will become an extremely sophisticated art, reducing energy consumption of all moving vehicles. Aviation, for instance, can reduce it's energy consumption per pax-mile by 70%. Batteries will decline in cost sharply, gradually making their way into heavy moving equipment and water shipping. Wind will become a major energy source for water shipping, and solar will follow behind. Synthetic fuels (from renewable electricity, water and atmospheric carbon) will become competitive at some point when they are needed. Their costs are probably $400/bbl now, but that will gradually decline. As liquid fuels become a small percentage of overall energy consumption relatively high cost per liter will become acceptable. The combination of all of these will dramatically reduce the importance of oil 50 years from now. Nope. Took one for a spin though, quite an excellent ride. If it's keeping the Koch bros up at night worrying...good...a small bit of penance. I know it's hard to believe, but you are. It's the top people at Exxon/Mobil, as well as people like the Koch bros, that are putting enormous political resources into this. I agree - most people in the oil patch don't think about this at all, and a few are trying to help the transition, like T. Boone Pickens (though he's found ways to profit from it, so he's not entirely altruistic....). there is nothing in the short/medium term that will alter the general energy picture. I think that's likely true, and yet...forecasting is incredibly difficult - who four years ago anticipated shale gas killing gas prices? Everyone in the real estate business felt just as confident 7 years ago, including billionaire real estate developers who felt their fortune proved their competence. Fifteen years from now EVs will be incredibly important. Does that matter to people who will be retired by then? Not to most people in that situation, but some, like the Koch brothers, take that as a threat to their fortune and a personal insult to their identity, and they fight back. Wind power is a threat to coal interests right now. Wind power with subsidies competes against coal. So what about the future? Will wind power costs rise or fall? In theory bigger wind turbines and refinements in technology should lower costs. But the highest quality wind areas got developed first. Plus, the larger the fraction of electric power from wind the higher the costs for back-ups for when the wind doesn't blow. But the biggest energy issue is transportation energy. So far oil has no real competition because batteries cost too much. The years we've discussed the future prospects EVs keep going by and battery costs still haven't come down very much. Wind power with subsidies competes against coal. New US coal is much more expensive than one might think - IIRC, wind doesn't need subsidies to compete against it. Even if it does, those subsidies are more than justified to account for actual external pollution costs. the highest quality wind areas got developed first. There's plenty of equally high quality areas left, at least in the US. Capacity factors for new wind installations are rising. the larger the fraction of electric power from wind the higher the costs for back-ups for when the wind doesn't blow. That might become important when we reach much higher levels - well above 15%. Even then they won't be large: demand side management and backup are both cheap. Remember: there's enough peak capacity right now, and building wind generation capacity won't cause a need for more, it'll just reduce capacity factors for existing generation. The Prius was competitive at $3 gas. A Leaf or Volt is competitive with a comparable ICE when you look at the total lifecycle cost: savings of $,1500 per year add up quickly. battery costs still haven't come down very much. They're falling, and fairly quickly. It's hard to tell because there's so much competitive noise, and because there's some proprietary secrets to protect. Declining oil consumption is a positive story. Well, yes and no. If consumption is declining because of better gas mileage and renewables then that would be positive. But if consumption is declining because of high oil prices then this is a mixed message. All products and services would be higher because of higher energy prices. People would simply buy less of everything. Good so far. But then people who once produced the goods and services that people are now doing without, are out of a job. This is bad. Look at it this way, if oil goes high enough then consumption will be cut in half. Then all the people employed producing all that stuff will be unemployed. Then as consumption drops further and further then more and more people are out of work. Soon over half the work force will be no longer working. Consumption down to less than half the original level. Employment down to less than half the original work force. Bad, very bad. Declining oil consumption means a declining work force. This is not a positive story. It would help your perspective, I believe, to think about prices and markets in a more nuanced way. Higher energy prices don't transmit through the economy in the simple way you mentioned ("All products and services would be higher because of higher energy prices"). In fact, from 2004 to 2008, when oil prices rose by roughly 4x, it had very little impact on consumer prices outside of energy and food (and food was mainly because of ethanol, not rising production costs). This is because businesses do the same thing that individual consumers do (but more so): they get more efficient, they find substitutes, and they cut out marginally valuable uses. It's like meat prices: if the price of beef triples, people will switch to chicken or pork. They may like beef a little more, but they're not losing much by the switch. Here's a good example: at the peak of oil prices in 2008, water shipping sometimes cut their speed by 20%, and reduced fuel consumption per ton-mile by 50%. That was a bit inconvenient, and raised the cost per ton-mile of fixed overhead a bit, but shipping wasn't stopped by high fuel prices. Although Zuckerman couldn't be more wrong today, I expect natural gas to substitute for oil in the medium term future. With XOM and other oil majors in the shale business, you can expect easy conversions to the ngv's since they will regulate it into existence. The technical guidance document, to be published in the Dec. 3 Pennsylvania Bulletin, was among the recommendations the Marcellus Shale Advisory Commission made to Governor Corbett. It will provide manufacturers, sellers and consumers of passenger cars and light-duty trucks with information about the requirements to ensure that converted vehicles comply with the Pennsylvania Clean Vehicles program. There is a great deal of irrational exuberance in the American mainstream media these days, based on a misunderstanding of what is going on in the oil and gas business. Things are not nearly as good as they look. I like the phrase irrational exuberance. I got it from the book Manias, Panics, and Crashes by Charles P. Kindleberger, which should be required reading for anyone investing in the stock market or real estate. It's kind of heavy going, but does give a thorough analysis of all the crashes that have happened over the last few centuries, which gives you an idea of what can go wrong with your investments and how to spot a crash coming. In this case the balance of US "petroleum" exports and imports has shifted from net imports to net exports simply because demand in the US has fallen due to recession and refineries have surplus capacity, which they are using to refine imported oil for re-export to other countries. In the past couple of decades the US has imported refined products because it had insufficient refinery capacity (nobody has build a new refinery in the US in the last 30 years), but now due to the fall in demand (people driving less, more efficient vehicles) they have surplus capacity. There is also a surplus of natural gas on the market due to the "shale gas revolution". Unfortunately - and this is something the MSM ignores - the economics of shale gas are underwater at current prices, so it qualifies as a bubble (this is the mania part in the book above). It can't persist indefinitely because companies can't continue to drill wells at a loss indefinitely (see panic and crash). The problem with manias is that people do continue to expand production even at a financial loss due to irrational exuberance, but at the end of it all there's a crash. The real problem is that it diverts attention away from the real problem, which is crude oil. The oil exporting countries are peaking, going into decline, and turning into net importers, one by one. The US, which once produced half the oil in the world, peaked around 1970, the North Sea peaked around 2000, Indonesia dropped out of OPEC because it is a net importer, and other producing countries have similar problems. The real crunch will hit when major producers like Saudi Arabia and Russia go into steep decline, and that day is coming in the not-too-distant future. Their combined net oil exports increased from 12.2 mbpd in 2002 to 15.9 mbpd in 2005 (an 8.8%/year rate of increase), but then fell to 14.3 mbpd in 2010 (a 2.1%/year decline rate). 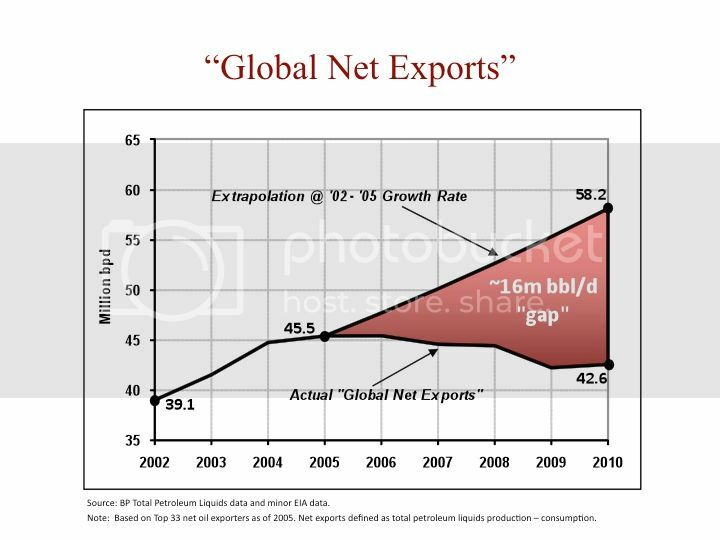 At their 2002 to 2005 rate of increase in net oil exports, they would have shown combined net oil exports of 25 mbpd in 2010.
westexas....your two Land Export Model charts show a 0.1 % & 1.0% annual decline rate. I noticed in your work above, Russia and Saudi Arabia show a 2.1% decline rate. 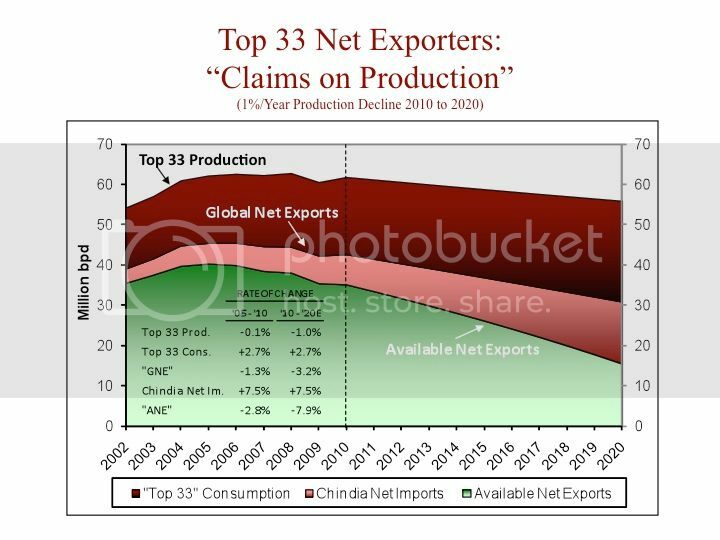 Do you have other charts that show what the Available Net Exports will be if there was a 2 or 3% annual decline rate? I still think your work in this area is completely overlooked by many in the industry. Note that we are dealing with multiple variables, with multiple rates of change, which is part of the problem in trying to explain "Net Export Math." The Russia and Saudi numbers are for the rates of change in net oil exports (which are a function of production & consumption rates of change). 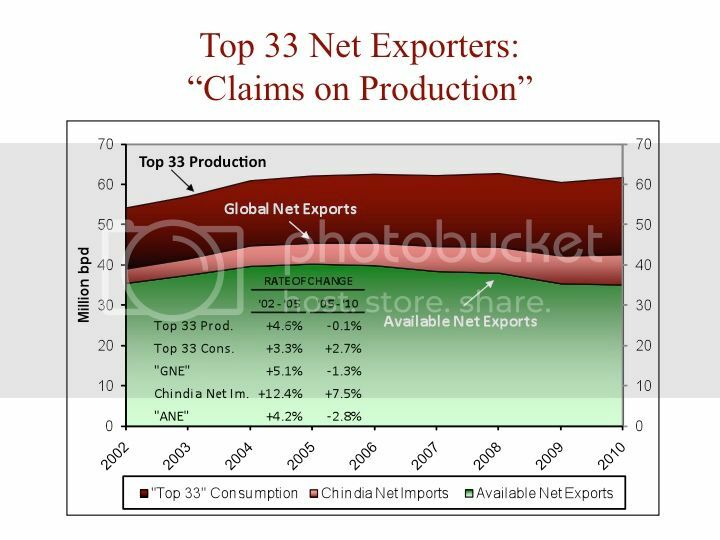 Based on the preceding assumptions, a -0.1%/year rate of change in Top 33 production resulted in a -1.6%/year rate of change in GNE for 2010 to 2020, and a -1.0%/year rate of change in Top 33 production resulted in a -3.2%/year rate of change in GNE for 2010 to 2020. The respective projected ANE rates of change were -5.1%/year and -7.9%/year for 2010 to 2020. *Of course, China and India's net import rates of change are a function of their own internal production and consumption rates of change, but note that China has recently shown signs of flat domestic production. When US oil production peaked in 1970, it caused our net oil import rate of increase to spike to 15%/year, from 1970 to 1977 (versus 11%/year from 1948 to 1970.
westexas....the charts reveal a sobering future. Have you received any requests for interviews on your new presentation? Anyone else out there seeing the LIGHTBULB go off, or are you just as frustrated that the blind are still leading the blind? I have have received two cable program inquiries (one from CNBC and one from MSNBC). In both cases, after they reviewed the net export material that I sent the producers, they said they might call be back later. Still waiting for a phone call. In past years, the WSJ ran at least one story touching on net exports, which quoted me, but since the change in ownership at the Journal, I have noticed a definite shift in their energy coverage, and I don't expect to see myself quoted in the Journal any time soon. 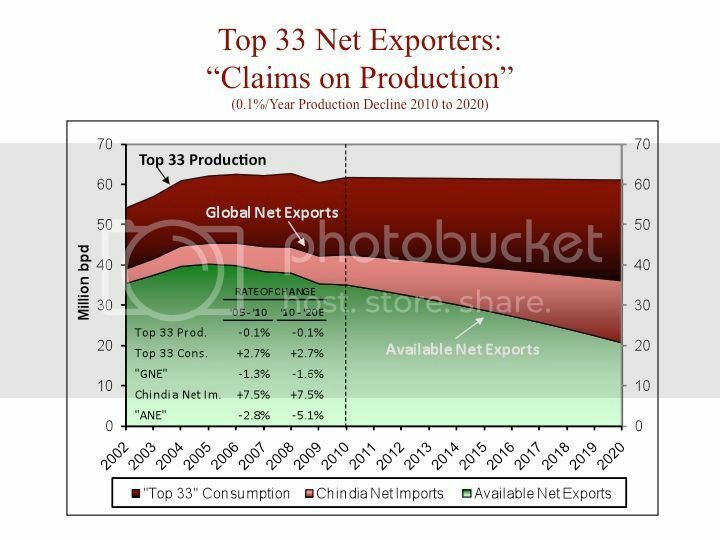 At the 2005 to 2010 rate of change in Chindia's net oil imports as a percentage of GNE, the Chindia region alone would consume 100% of GNE in only 19 years. IMO, this should be, but obviously is not, the #1 story in the world. On the natural gas side, I have frequently compared Art Berman's work to Meredith Whitney's early warning about a financial meltdown. Like Meredith, who warned about financial problems prior to the financial meltdown, Art is one of only a handful of people pointing out that the shale plays are not all that they seem to be. How interesting. In reality... I am not surprised. Anyone who knows anything about the gold market (except maybe Peter Schiff and Marc Faber) don't get any air time on CNBC. Dennis Gartman is one individual who does get a great deal of air time on CNBC as a gold analyst. Funny, the professional traders have made a great deal of money over the years making bets on the exact opposite of Gartman's gold calls. I gather the truth in oil and precious metals markets is not good for business for those corporations who own these financial stations. Oh the irony - wasn't it less than 5 years ago the MSM were screaming that it was lack of investment in refinery capacity that was driving petrol prices so high? Yet here we (you) are employing spare capacity to add value to and re-export products made from imported crude oil. Good for the economy in itself, but it won't prevent total economic collapse. The shale gas economics are hugely different. For one, the decline rates in the fracked wells are very fast. For another, the amount of greenhouse gases produced is close to coal. And, as you so sagely noted, the shale gas players are forced, at the moment, to produce gas at a loss. The 100 year figure on shale gas looks like a vast, vast overstatement. Probably more like 30. If you start fueling cars and trucks with the stuff, that figure goes down even faster. It IS a mania. A maniacal attempt to retain dominance in the energy markets. On the one hand you have this desperate shale gas play and shale gas players taking their losses. On the other hand you have wind energy at grid parity and solar fast approaching. Then you have the Chinese coming in with their panels dumping on the US market in an attempt to assert their own brand of dominance. It's just a giant energy war free for all. For the US to have the lions share of world refining capacity creates an interesting situation.... think of seniorage. I was thinking about this the other day and wondering how the U.S. ranks in terms of refining capacity - volume and ability to refine all types of oil. I was imagining a scenario where the U.S. becomes a major exporter of refined products as we slide down the curve, with many underdeveloped and developing nations with oil increasingly becoming unable to refine. Okay, I'll go even further to speculate that their inability to refine is a result of not just economics, but sabotage to the refineries. Umm, sounds like a good plot for a end-of-the-world flick. Ummmm. The US has about 25% of global refining capacity, but that proportion is decreasing as the newly industrialized countries like China and India build more and more oil refineries. The US has not built a new refinery in over 30 years, whereas in China they're popping up like mushrooms. This is not a source of opportunity for the US, it is just a consequence of riding the US oil supply curve downward as reserves run out. The refineries have a lot of sunk costs, so they're just running them on imported oil because that is cheaper than building a new refinery in some other country. The exports are largely diesel fuel because that is the big demand in other countries, whereas the demand in the US is primarily for gasoline. However, there are limits to this process. The US refineries are not recovering their replacement costs, and as they get older eventually will become uneconomic to operate. Also, sooner or later it is going to dawn on the Canadian oil sands producers (the largest source of US oil imports) that it is more efficient to refine the oil sands bitumen direct to end products in Canada and export the high value refined products to the US than it is to export bitumen at a discount. The US government has been expediting this realization by holding up approval on pipelines to take the bitumen to the US Gulf Coast, and California has done the same by more or less prohibiting imports of Canadian bitumen. Of course, having US refineries shut down due to inability to compete (even if it is a result of US government policy) will go over badly with the US government and US oil refiners, which will insist that this is some kind of unfair trade advantage. Many US refineries have been modified to handle heavy, sour crude in recent years because world oil supplies are increasingly heavy and sour. I think in the next few years a lot of refineries which have not been modified to handle the changing supplies (particularly east coast ones) will be closed. I don't know if the Asian refineries are a misallocation of capital. They need the ability to supply their growing market for products, particularly in China. A lot of China's domestic oil is heavy, and their import stream is increasingly heavy, so they need the ability to process it. I've read that China has put in a concerted effort to build refineries that can handle heavy sour crude. It is well known that much of the "spare capacity" that Saudi Arabia has is essentially useless because it is heavy sour crude that most refineries can't handle. China is building refineries so they'll be able to handle such crude. Does anybody else here remember the old Mr. Magoo cartoon character? He was the irascible old geezer in a wheelchair who opened his eyes only occasionally, just long enough to completely misinterpret the actuality and significance of whatever was in his immediate field of vision. His "problem" wasn't that he was actually stupid, but rather that he continuously interpreted his complex moving cartoon world based on instantaneous "snapshot" observations. This cartoon, if rewritten as a novel by somebody really good, such as David Adams, could take its place alongside Gulliver's Travels, Alice in wonderland, and other such classical "children's" works that are even better the second time around as political and social satire. The Mr. Magoos of this world outnumber everybody else combined by at least a thousand to one.....as my old folks used to say " Lord help us" !! I've used the "Sixth Sense" analogy (many ghosts don't know they are dead, and they only see what they want to see). As in the movie "The Sixth Sense," for most of us our auto-centric suburban lifestyle is dead, but we just don't know it yet, and we see only what we want to see. As noted up the thread, the MSM are presenting a symptom of Peak Exports (the US being gradually shut out of the global market for exported oil) as good news. Key message for US citizens (if that term still apply), much before global peak or not etc, should be : Did you know we went through our oil production peak in 1970, yes that is 41 years ago, 10 millions barrels a day then, 5 now, and yes quite a bit has been done to cover/muddle around this from you, like for instance labelling the first oil shock "Arab embargo", when the key event of this shock was of course the US(then top producer) going through its peak. Zuckerman is merely doing what is so often done in energy analysis only more egregiously. IMO no other commodities area suffers from this as much. It is comparing, adding, subtracting etc. things that are different. In metals no one dares compare, add or subtract iron ore and steel and expect a meaningful result. Likewise in the grains corn and soybeans are never added together. Soybeans and soybean meal are well understood to be completely different things. But with energy, anything goes. All forms of energy can not be lumped together. Even crude oil and refined crude oil products are different. It gets really crazy when energy forms that are little related to each other are analyzed using EROEI/Net Energy as in non-renewable compared to renewable. The other day a graph was posted on TOD that not only compared EROEI of completely different forms, but did it across variable time. If I recall correctly EROEI of oil in 1930 was compared to the EROEI of bio fuels today. This was done to exaggerate an "energy cliff". In Zuckerman's faulty analysis at least he is staying in the liquid/gas fossil fuel area where depletion rules. Yeah . . . the entire article is a sham based on conflating gases and liquids. You just can't fill your car with natural gas. Now sure, you can convert vehicles to run on natural gas and you can build gas-to-liquids plants . . . but those are both expensive and take time. They have not happened to any noticeable degree. So you just can't replace gasoline & diesel with natural gas. It is that simple. They have not happened to any noticeable degree. So you just can't replace gasoline & diesel with natural gas. It is that simple. Before you say that you could never put gas on the roof of a vehicle today, consider that we have CNG municipal buses running around with 3000 psi cylinders on the roof! But, even though it (widespread use of CNG) could be done, it won't be. I fully agree that you can convert vehicles. My point is that we have not done that yet to any noticeable amount. Thus, you can't fill your conventional gasoline car with natural gas. I wouldn't be surprised if natural gas vehicles catch on if the shale gas revolution keeps NG prices down. But NG price may creep back up. And I think you might as well go straight to electric vehicles. Electricity can be made from coal, natural gas, solar (on your own roof! ), wind, nuclear, etc. I think Mr. Zuckerman is just pushing the Big Business Party line. It's all part of the plan to open up the remaining resources for exploitation. His claims are not that much different from those by The Newt in his book, "Drill Here, Drill Now, Pay Less" (2008), which claims that the US has the potential to become independent of oil imports and that the Colorado Green River oil shale represents a massive store of oil which can easily be extracted. Newt even writes about PUMPING the oil out of the Green River shale, even though he earlier describes the oil shale's kerogen as a paraffin or wax like material, which he says must be heated to "capture the oil that's released". How about calling it the 'Koch Brothers Climate and Economic Devastation Act of 2012?' I think it has a nice ring to it, don't you? TWILIGHT IN THE DESERT book, we were able to get some telephone time with him, and included a question about the inclusion of railway mains expansion and extension in "Plan B". Matt allowed as how rail mode offers a clear-cut means of maintaining distribution and economic viability through the Oil Interregnum. IF, and he emphasized how big the "if" would be, the politics against railway line extension by NIMBY elements would understand the ramifications of Peak Oil. About that time, we also made some contact with Mortimer Zuckerman through his office, and actually got some telephone conversation with him as well. He was not worried about oil back then. As for railways in an oil crisis mitigation plan, he could not endorse railway expansion unless the projects penciled out -in advance of an energy emergency! As in, no money for fire suppression until the flames appear!! As TOD readers know, just the steel in the pipe going into the fracking gas fields (pun intended) would go a long way to rehabbing the US dormant rail lines. Back in November, Gail The Actuary did a piece about the perils of waiting too long before we redirect highway funding into rail capacity enhancement. Someone associated with Mr. Zuckerman will explain to him why the Mormon Church, long of a mind aware of famine scenarios, has secured control of railroads like the UP, and several major trucking operators... Its more than just about money! There is an effort out in California to obtain Chinese investment for rebuild of selected agricultural branch rail lines now dormant. Is that our fate, to even have much of our homeland food shipments controlled by foreign interests? It may be, that Federal Executive Emergency Orders for operation of transport will allow fair distribution of victuals in emergency, but it is disheartening to see the "Smart Money" so ignorant of a national need to assure Second Dimension Surface Transport Logistics Platform matrix in the coming motor fuel crunch. Haven't paged through that mag in decades. I see it hasn't changes from when I knew it as US Spews & World Distort. Yeah . . . of course. I mean I filled up my car with natural gas just yesterday. But seriously . . . how stupid are people? Reduced US oil consumption, deepwater oil, and conventional oil from shale formations have reduced oil imports. But shale gas? C'mon. Is education so bad that people can't distinguish between gas and liquid? This is really really stupid or shameless propaganda. I'm not sure which is worse. Yes, the reduction in US oil imports is primarily the result demand destruction caused by recession and the collapse in people's net worth due to the decline in value of their houses. They just can't afford to buy as much imported oil as they used to. US refineries are exporting more oil products to other countries because some countries economies (particularly that of China) are not in nearly so bad shape and their economies are growing rapidly regardless of the downturn in the US. A secondary factor is the arrival on the US market of large amounts of new oil sands production from Canada and new shale oil production from North Dakota, which has been depressing oil prices in the interior of the US. This gives SOME US refineries a competitive advantage over those in other countries because they are paying less for oil. Mid-Western refineries can make a lot of money by processing cheap Canadian and ND oil and sending the products to Europe and Asia. By contrast, oil refineries on the East Coast are being closed. It is best not to get overly optimistic about this new oil because a lot of the Canadian oil sands production is now owned by the Chinese, and the North Dakota oil boom will eventually come to an end as all oil booms do. the reduction in US oil imports is primarily the result demand destruction caused by recession and the collapse in people's net worth due to the decline in value of their houses. They just can't afford to buy as much imported oil as they used to. I think that's incorrect. US GDP has gotten back to pre-recession levels, so reduced consumption is not caused primarily by reduced incomes and "demand destruction". For instance, Vehicle miles traveled have dropped by 2% ( http://www.fhwa.dot.gov/ohim/tvtw/11septvt/11septvt.pdf ), but gas consumption has dropped by 5.5% ( http://www.eia.gov/dnav/pet/pet_cons_psup_dc_nus_mbblpd_a.htm ). That means efficiency gains have been much larger than reduced driving. We have higher efficiency. We have 1 million barrels per day of ethanol. We have 500 million barrels per day of increased production of crude and liquid equivalents (some of this nat gas liquids). And we have some demand destruction. That about does it. To say that natural gas saved the day is a bit delusional and premature to say the least. First, I don't think the day has really been saved. I mean, aren't we here sitting at $100 per barrel oil? Hello? IMO, either world economic growth tanks again or we see another run up in oil prices. That's the choice right now with 80 million new cars being sold each year and a total world automobile population of about 1 billion. Demand destruction is an economic term used to describe a permanent downward shift in the demand curve in the direction of lower demand of a commodity such as energy products, induced by a prolonged period of high prices or constrained supply. A familiar illustration of demand destruction is the effect of high gasoline prices on automobile sales. It has been widely observed that when gasoline prices are high enough, consumers tend to begin buying smaller and more efficient cars, gradually reducing per-capita demand for gasoline. If the price rise were caused by a temporary lack of supply, and the price then subsequently goes back down as supply returns to normal, the quantity consumed in this case does not immediately go back to its previous level, since the smaller cars that had been sold remain in the fleet for some time. Demand thereby has been "destroyed"; the demand curve has shifted. That's not the way you used the term in the previous comment, to which I replied. The previous comment said: "the reduction in US oil imports is primarily the result demand destruction caused by recession and the collapse in people's net worth due to the decline in value of their houses. They just can't afford to buy as much imported oil as they used to." That's the usual usage of the term on TOD: forced conservation, with an implication of hardship and sacrifice. Now, if we want "demand destruction" to mean a shift in the demand curve due to greater efficiency and use of substitutes (with an implication of no reduction or a very minimal reduction in standard of living), that's great. We just need to be consistent. Currently NG is at what, about $4? What price level do you think is needed for shale producers to begin to make a profit? Nick - Depending exactly where you are its been bouncing up around $4.50/mcf. If you're talking about the pure E Texas shale plays like the Haynesville Shale, back in late '08 once prices dropped below $6/mcf there wasn't much profit on many of the wells. Of course, drilling costs had gotten rather high towards the end of that boom. Now, in the Eagle Ford shale, the profit is coming from the oil and not the NG so much. With the demand for rigs and equipment in the EFS running costs up I suspect many of the pure NG shale plays are having difficulty making much of a profit. That sounds like a classic boom: if only production levels and rig/equipment costs were just a little lower, and prices were just a little higher, things would be fine. But new production keeps coming, equipment costs keep rising, and prices stay low or fall further. Until something breaks: maybe a recession makes demand fall, and we have a bust. The people who can weather the bust will be ok.